Tune overall system.. 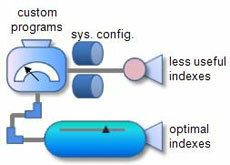 Tune custom programs..
Indexing is a powerful way of tuning a database system. However, when used wrongly, it causes equal problems. Rapid Index eliminates unnecessary indexes and finds fewest indexes to tune most ABAP programs with least side effects. Vanilla SAP R/3 (ECC) system comes with around 6,000 secondary indexes. Our studies show that customers add about 300 more to tune custom ABAP programs. Over a period of time, some processes change & some become obsolete. Also, with data archival & changes in growth rates, table sizes change significantly. Because of this, 35% to 45% of custom secondary indexes become useless. Rapid Index eliminates such indexes. Actual usage at customer site has shown a 75% to 90% improvement in performance.